By Send2Press Newswire on November 10, 2011 in Books and Publishing, Finance, General Editorial, New Jersey, Press Releases, WALL, N.J.
WALL, N.J., Nov. 10, 2011 (SEND2PRESS NEWSWIRE) — Peter Grandich, market commentator and publisher of the internationally-followed Grandich Letter (www.Grandich.com), has released his autobiography entitled “Confessions of a Wall Street Whiz Kid” (ISBN: 978-0615550633). Called “thought-provoking,” “entertaining” and “a remarkable memoir” by experts in the world of finance, the book is now available through Amazon.com. “I didn’t grow up in an educated family; my parents didn’t introduce me to Wall Street or investing at an early age; we didn’t even have much money. In essence, I am probably the most unlikely person to someday be called ‘The Wall Street Whiz Kid,'” says Grandich. He got the title in 1987 on Good Morning America when the 31-year-old Grandich, who never finished high school, accurately predicted the Black Monday market crash. He has since made so many accurate market calls that he may go down as the Nostradamus of the economic world. As a result, his blog at www.Grandich.com has become one of the most popular on the web. In this intimate, witty and painfully honest real-life story, Grandich shares his thoughts about the accumulation of wealth and the hidden flaws of traditional financial planning. He exposes some of the dirty business of Wall Street and takes readers on a journey through his battles against panic attacks, suicide attempts and depression, and he shares how his faith not only helped him regain the will to live, but acts as the foundation for his financial beliefs. A contrarian by nature, Grandich also explains what he sees as the next great threat to the U.S.
“Peter Grandich reveals his personal journey, not just from rags to riches but from material wealth to spiritual wealth. His insights into the flawed nature of financial planning and the false god of retirement are alone worth the cover price,” says National Post columnist and author Jonathan Chevreau. 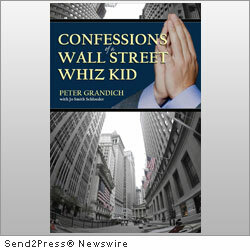 “Confessions of a Wall Street Whiz Kid,” by Peter Grandich, was written with Jo Smith Schloeder. For more information and to read reviews, visit the book’s website at www.ConfessionsOfaWallStreetWhizKid.com or go to www.Grandich.com . News Source: Peter Grandich :: This press release was issued on behalf of the news source by Send2Press® Newswire, a service of Neotrope®. View all current news at: http://Send2PressNewswire.com .